Nearly 3,000 miles from the coastline of his native England, the forty-nine-year-old Valentine Baker led his drowsy Turkish battalions under the cover of darkness toward the village of Tashkessen on the night of December 27, 1877. Baker, at one time an illustrious colonel of the Tenth Hussars, had been cast out of the British Army for being attached to one of the most notorious scandals of the nineteenth century. He was indicted on controversial charges of sexually assaulting a young female passenger on a train ride in the summer of 1875 and became vilified throughout all of England for this misdeed. Queen Victoria prohibited Colonel Baker to honorably resign from the army, even further humiliating him. Everything that defined his life: honor, reputation, and his distinguished military career vanished from Baker’s world. Exiled from his homeland after his release from a prison sentence one year later, Colonel Baker sought military service as a soldier-of-fortune in the Ottoman Empire. With the outbreak of war between the Russians and the Turks in April of 1877, Baker found the perfect opportunity to redeem himself on the battlefield. Serving with the rank of major general, he was celebrated for his fearlessness and aptitude for command while fighting in Eastern Bulgaria. He became universally known as the “Inglese Pasha,” overcoming religious and ethnic differences to win the affection of his Turkish soldiers. During the winter of 1877, he was given command of small division while stationed near the city of Sofia. Roughly 65,000 Russian soldiers began to march through the Balkan Mountains in an attempt to outflank and encircle a 12,000-man Turkish army protecting against an advance into Western Bulgaria. Most of the Turkish soldiers suffered from the bitter cold, infectious diseases, and lack of food while serving in the mountain entrenchments, leading to a plunge in morale. Baker convinced his superior commander to allow him to take roughly 1,000 men to the village of Tashkessen to delay the Russian advance long enough for the Turkish army to escape south. Baker arrived in the village of Tashkessen sometime after 9:00 p.m. on the night of December 27. He arranged his battalions on three knolls in front of the Tashkessen Pass to guard the main road leading to the rear of the Turkish army. For three days he strengthened his position by ordering his men to dig entrenchments and stack rocks chest high. By December 30, reinforcements arrived, bringing his total strength to around 3,000. The Russians vanguard managed to gather roughly eight times his number (25,000 men) in front of Tashkessen. The next day, the Russians launched a furious assault to drive the Turkish battalions from the three knolls. Baker somehow managed to beat back one assault on his left flank, then another on his right flank. 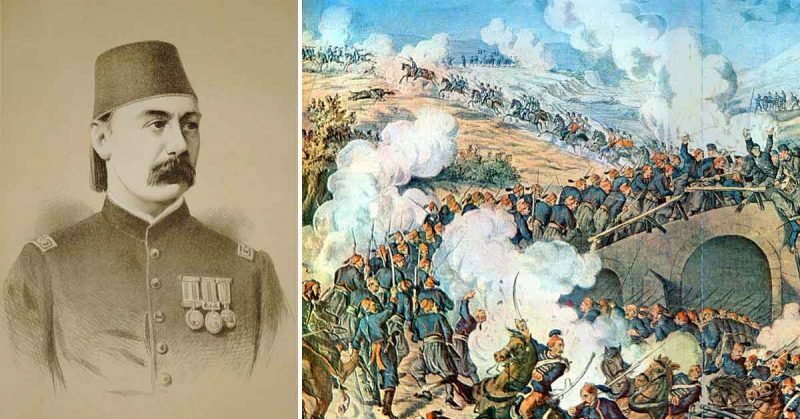 At one point, his men charged in a bold counterattack with bayonets fixed to repulse an assault from the elite Russian Imperial Guard battalions. When pressure on his flanks became too great, Baker pulled his men back to a second position closer to the head of the mountain pass. There he intended to make a last stand until all the 12,000 men of the Turkish army were successfully evacuated. His calm bearing during the engagement helped to inspire his men to remain steady as the Russians continued to assail the second position. For hours the heated contest continued, and Baker stood erect in the center of his line disregarding the bullets whistling past his head as he calmly issued orders to his staff. Baker’s tiny force held out until nightfall when he finally received word that the Turkish army had evacuated their defensive lines and moved safely out of harm’s way. Only then did he evacuate his position and marched to join them under the cover of darkness. The exhausted men of Baker’s command were mustered that evening after the battle for roll call. More than 800 of the defenders had bravely sacrificed their lives to shield the retreating Turkish army. Baker gave the Turks one of the only victories in humiliating Russo-Turkish War. The battle proved to be Baker’s finest hour, and he afterward wrote that “There are moments in the past of many a man’s career that stand out clear and defined after the lapse of even many years: life pictures, the very memory of which brings back a glorious thrill of pride and pleasure. Regrettably, the deeds of Baker and his men at Tashkessen have drifted into obscurity nearly 140 years later. Baker, Valentine. War in Bulgaria: A Narrative of Personal Experiences. 2 vols. London: Sampson Low, Marston, Searle & Rivington, 1879. Jastrzembski, Frank. “Baker’s Spartan Stand: Buying Time at Tashkessen 1878.” Soldiers of the Queen 159 (March 2015): 3-9. Jastrzembski, Frank. Valentine Baker’s Spartan Stand: A tarnished English soldier’s redemption at Tashkessen, 1877. London: Pen & Sword Books Ltd. (forthcoming release in 2017).